Let's see how it compares to the tried-and-true Lumia 950. Inside the box is the phone, a case, a display dock, a mouse and a keyboard. All you need is a monitor to take your work out of your pocket and onto a big, productive screen. If the Liquid Jade Primo’s camera didn’t struggle so much, this might be the Windows phone to beat. Unfortunately, it’s not—but you don’t have many alternatives. HP’s Elite x3 smartphone is just around the corner, and HP promises business users will be able to tap into a world of virtualized Win32 apps that power traditional PCs. Acer doesn’t offer this capability. 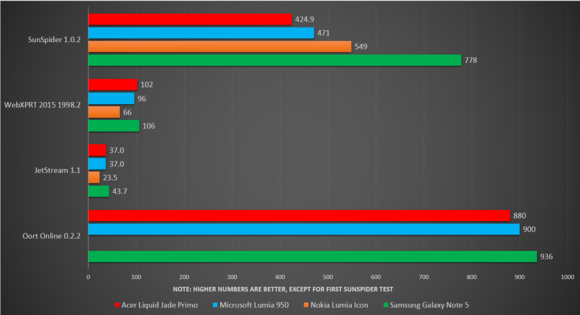 Otherwise, the Liquid Jade Primo is simply a larger, more powerful, more expensive Lumia 950, the basis for this comparative review. Acer’s Liquid Jade Primo may seem a little too big for your hand, but remember that you can hold down the Windows key to trigger a one-handed mode. On paper, the 5.5-inch Liquid Jade Primo matches up well with Microsoft’s own phone. But it comes with a big honking price tag, too: $649. Add up the price of an unlocked 5.7-inch Lumia 950XL ($499), Display Dock ($99), a keyboard and mouse—the two bundles are almost identical. But the slightly smaller 5.2-inch Lumia 950 is far cheaper: $349, or even $298 direct. That, plus a Display Dock, is just under $400. If you already own a standalone mouse and keyboard, the Liquid Jade Primo may be a bit too rich for your blood. As phones go, the Liquid Jade Primo feels like an executive’s phone: large, weighty, authoritative. You’ll feel the heft, though, as it weighs 0.33 lb (150 g) alone and about 0.42 lb with the case attached. I measured the phone at about 6.19 inches long by 3 inches wide by 0.375 in (9.5 mm) in thickness, with the case attached. Adding a case to the package is a nice touch: the plastic case covers the phone on the rear and sides (with cutouts for the volume rocker, power button, front/rear cameras and speaker), with a flip cover for the front that protects the screen. Unfortunately, it’s not like HTC’s Dot Cover, which allowed some information from the glance screen to pass through; you’ll need to flip open the cover to view it. Oh, and don’t drop it into the sink, either, as the Liquid Jade Primo isn’t waterproof. A much more significant drawback, however, is that Acer didn’t take the case into account when using it with the display docking station. If you have the case attached, you’ll need to remove it each time you dock the phone. That gets old fast. 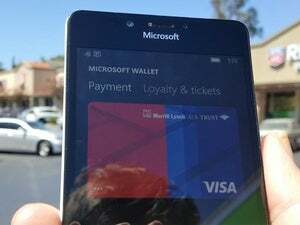 You might wonder if the case will prevent Windows 10’s tap-to-pay Wallet app from working: no, but it never will, either. That’s because the shipping version of the phone runs Windows 10 Mobile version 10586.318, rather than the more recent Windows 10 Anniversary Update that enables tap-to-pay. It’s a moot point, however, since the phone lacks the required NFC connection. Acer’s phone doesn’t support Windows Hello, either, lacking an iris scanner or fingerprint reader. Otherwise, Acer’s choice of hardware is a mixed bag: the 1920x1080 resolution display will disappoint those used to higher-res displays on Android and iOS, though the AMOLED screen displays deep, rich blacks. (The Lumia 950 uses a 2560x1440 AMOLED display.) Qualcomm’s 1.8GHz Snapdragon 808 (also inside the LG G4, among others) is the same chip that the Lumia 950 uses. As the rest of the phone world moves beyond 32GB of internal storage, Acer has stuck with it. There’s an optional microSD slot, up to 128GB, that provides external storage. (The phone actually ships with two SIM slots, one of which can accept microSD cards. If you choose to use two SIMs, you’ll forgo the SD expansion slot, however.) The included 3GB of RAM provides plenty of headroom for multiple apps, and there’s LTE Cat. 6, Bluetooth 4.0 EDR and 802.11ac for connectivity. As with most phones of its generation, the Acer Liquid Jade Primo is powered by a USB-C charger. The Lumia 950 charger worked just fine. 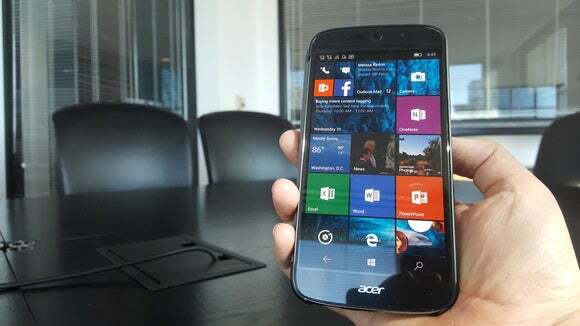 Unfortunately, as a business-oriented phone, Acer has made some sacrifices. The Liquid Jade Primo’s external speaker is loud enough, but with a flattish audio response—typical for most smartphones. 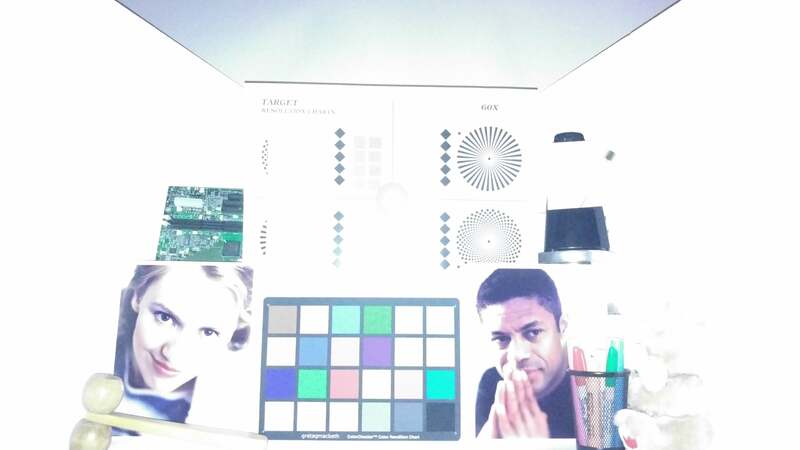 Among the Microsoft’s Lumia 950’s hidden features, however, were a graphic equalizer and Dolby Audio. The Liquid Jade Primo does away with that, which is disappointing. Acer’s 2,870mAh battery is non-removeable, though the plastic backing on the phone will unsnap at least partway from the top. (Oops.) Everything is powered via USB -C (Type 3.1), and a green LED will light when the phone is fully charged. 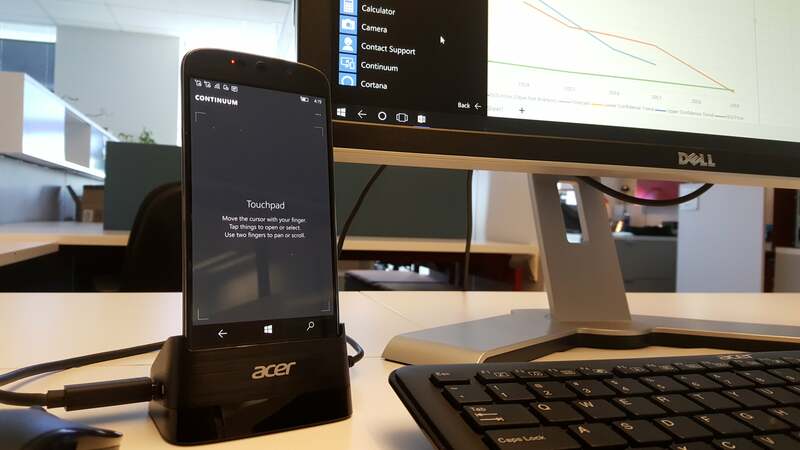 If you’ve followed any coverage of the Lumia 950 or Windows 10 Mobile, then you’re probably familiar with Continuum: Microsoft’s PC-like experience for users who connect their phones to the Microsoft Display Dock. Acer’s bundle contains one of its own, also referred to as a Display Dock, and the experience is virtually identical. 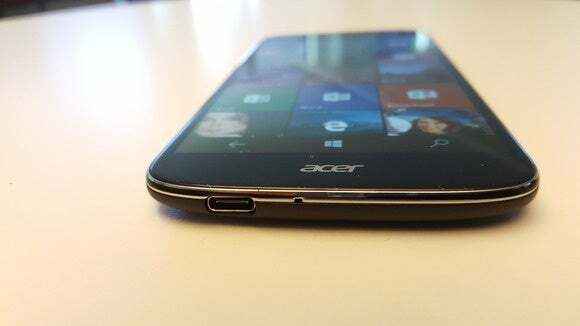 The advantage Acer offers, however, is that the Liquid Jade Primo nestles into a slot, connecting via an upturned USB-C connector in the base. (The Lumia 950 lies flat, connected to its Display Dock via a USB-C cord.) I’m a little concerned about how the connector will hold up over time, however, as I occasionally needed to wiggle it a bit to seat it correctly. 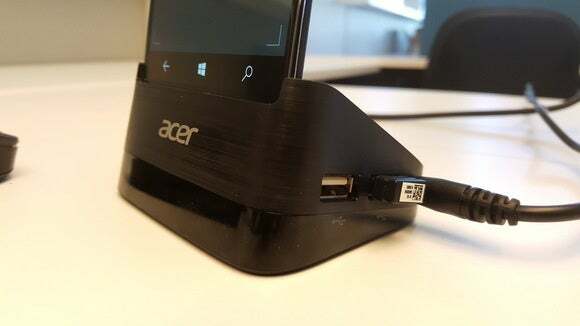 Acer’s dock is sturdy and well made, with two USB 2.0 ports, a USB 3.0 port, and an HDMI connection. Note that the Acer mouse dongle will occupy one of the USB 2.0 ports, and the keyboard the other. To connect the phone, you’ll need a monitor with HDMI. Acer’s manual indicates that the the dock won’t work with a monitor at a higher resolution than 1080p, though I didn’t test that claim. You'll need to launch the Continuum application on the phone, and the Connect app on the PC, to establish the connection between the two devices. Once connected, the phone displays the desktop in a Windows 10 desktop-like environment, using the phone as a touchpad. 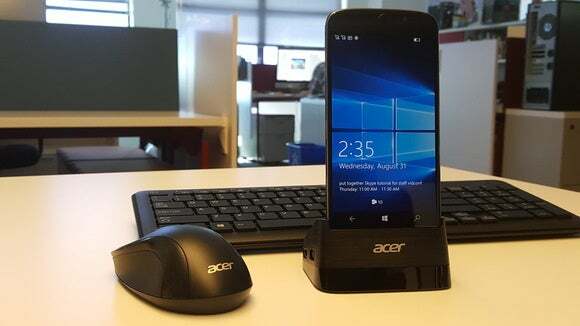 That’s a little awkward when the phone is docked, so fortunately Acer threw in a mouse and keyboard. Acer’s two-button wheel mouse is a bit of a throwback in that there’s a dongle, rather than a direct Bluetooth connection to the phone. Neither the mouse nor the keyboard is quite the quality that you might expect from a Microsoft or Logitech model, but both were surprisingly comfortable. Of course, you can always replace them with your own equipment. Dock the Acer Liquid Jade Primo for a PC-like experience. Otherwise, as I’ve found before, a wired connection to the Liquid Jade Primo is really the only way to use the Continuum experience. Moving the mouse felt a little laggy, but the keyboard proved responsive, and I was able to type my notes about the phone’s performance in Word Mobile, saving constantly to the cloud. Note that only UWP apps like Word, PowerPoint, and Calendar are available via Continuum. For others, such as Yelp, you can use Edge and the mobile Web site instead. Acer did not ship any third-party bloatware, or any of its own applications, with the phone it shipped me for review. With the phone docked, Skype wanted to take images with the front-facing camera in landscape mode. 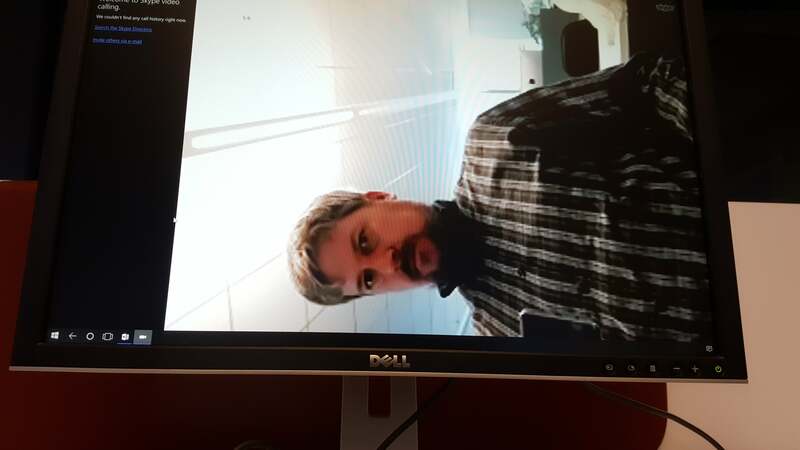 Undocked, the Liquid Jade Primo shot Skype video in portrait mode. I’m not entirely sure the world has bought into Microsoft’s vision of the “phone as your PC,” but the Liquid Jade Primo does. The Liquid Jade Primo’s memory and processor aren't the absolute cutting-edge, but they’re close enough not to make a difference. On more than one occasion, I tried to swipe right on the home screen to reach the second screen of apps, and the phone didn’t respond on the first try or moved sluggishly. Apps loaded snappily enough, however. 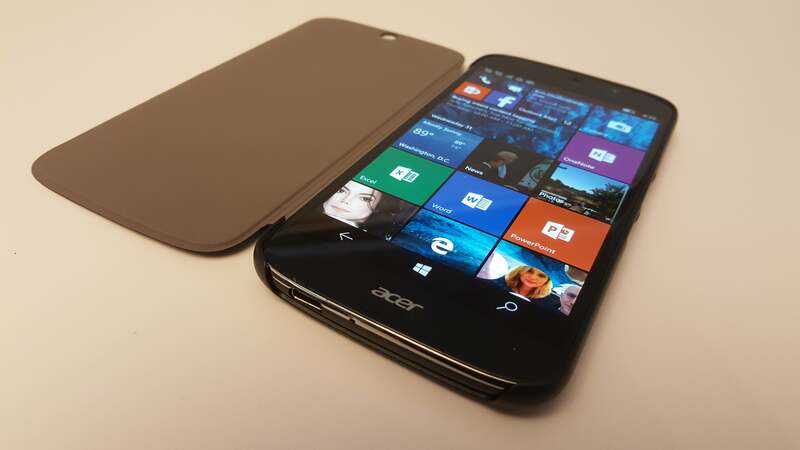 Acer’s Liquid Jade Primo is about equal in performance to the Microsoft Lumia 950. The two share the same Qualcomm Snapdragon 808 hexacore processor. Unfortunately, Windows phones lack the modern testing apps that have been written for Android and iOS. To compensate, I ran a few browser-based tests to generate equivalent results across the various platforms, adding an older Android-based Samsung Galaxy Note 5 just for fun. Really, though, there’s just one comparison to make here: the Lumia 950 versus the Liquid Jade Primo. I tested using older, outdated benchmarks (SunSpider), as well as modern tests that measure how the phone handles modern Web technologies (WebXPRT and JetStream). Finally, I used the Oort Online benchmark, just to see how the phones would handle moderately advanced graphics. In general, the Liquid Jade Primo performs just as well as the Lumia 950, and slightly worse than the older Note 5. But while the Note remained relatively cool throughout, the Liquid Jade Primo warmed up fast. Acer boasts that the Liquid Jade Primo includes an advanced cooling system that routes heat away from the microprocessor. Under load, however, the phone heats up dramatically, and there appears to be some thermal throttling going on, too. All of the heat appears to vent out near the top of the phone, however, away from your hand and where the dock would grasp the phone. I’m not entirely certain which Windows 10 Mobile apps demand a powerful CPU, however. Asphalt 8: Airborne remains a testing icon, as it’s a fast-paced, somewhat graphically intensive game that ran well. But Windows 10 Mobile’s small stable of games—Minecraft, Grand Theft Auto III, Terraria—don’t necessarily need a lot of horsepower. I doubt most business apps don’t either, with the possible exception of a video-intensive app like Cisco WebEx Meetings. What most smartphone owners demand, however, is long battery life. To test it, I adapted the battery-life test that we use for PCs and smartphones: looping an (unconverted) 4K video until the battery expired. Unfortunately, while the version of Windows 10 on the Liquid Jade Primo allowed me to set the brightness intervals at increments from 1 to 100, the Anniversary Update within the Lumia 950 uses far more granular settings, so I had to approximate the two. In any case, the 2,870mAh battery on the Liquid Jade Primo and the 3,000mAh battery on the 950 yielded nearly identical results: 5 hours, 49 minutes for the Liquid Jade Primo; and 5 hours, 43 minutes for the Lumia 950. Camera shootouts may be a thing of the past, but longtime Lumia owners take pride in the phone's photographic capabilities. 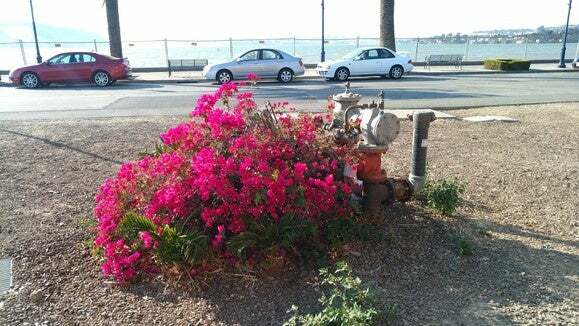 While the Liquid Jade Primo's 21MP rear camera slightly outclasses the 20MP model on the Lumia 950, something about its lighting sensor caused it to fall short. First, the specs: The Liquid Jade Primo’s camera includes a f/2.2 aperture on both the front and rear cameras, smaller than the f/1.9 aperture on the 950. The Liquid Jade Primo boasts a front-facing 8MP camera, far outpacing the 5MP, f/2.4 camera on the Lumia 950. Acer’s phone also shoots 4K video with the rear camera and 720p with the front-facing camera. Test shots in our photo lab using the Acer Liquid Jade Primo. Clockwise from upper left: full brightness, minimal brightness, lamplight, lamplight with flash. The Liquid Jade Primo shoots acceptable photos in daylight, but everything looks a bit washed-out at a distance—the Lumia’s photos are simply richer, with truer blues and greens. That’s not the case during closeups, though, which makes me think that the Liquid Jade Primo’s light sensor might be a bit off. On the other hand, the Liquid Jade Primo’s zoomed shots look much better than the Lumia 950's: Everything’s a bit fuzzy, but details were much more discernible compared to the grainy results the 950 yielded. Test shots in our photo lab using the Microsoft Lumia 950. 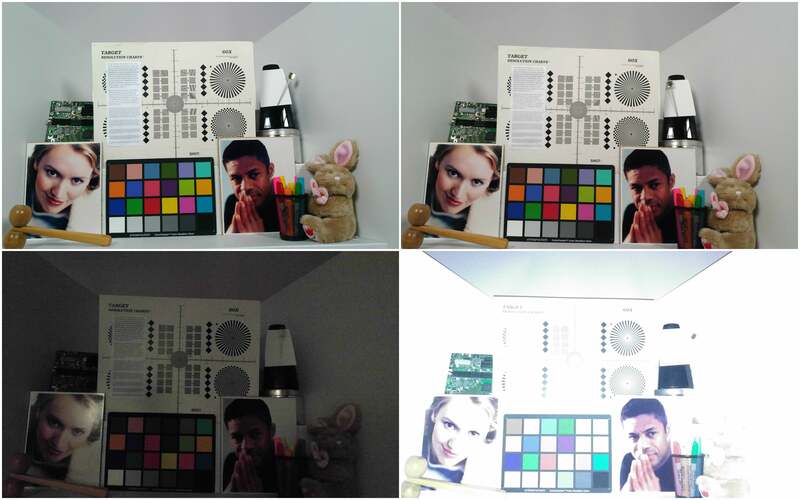 Clockwise from upper left: full brightness, minimal brightness, lamplight, lamplight with flash. 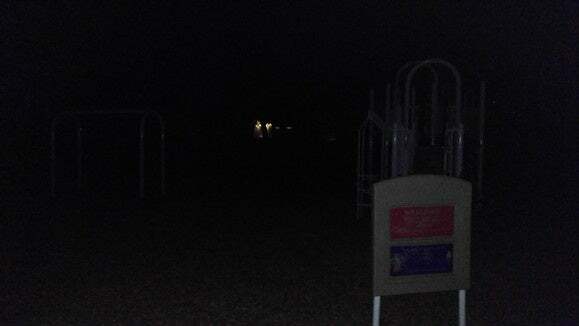 What I assume to be a light sensor issue shows up using the flash, too. 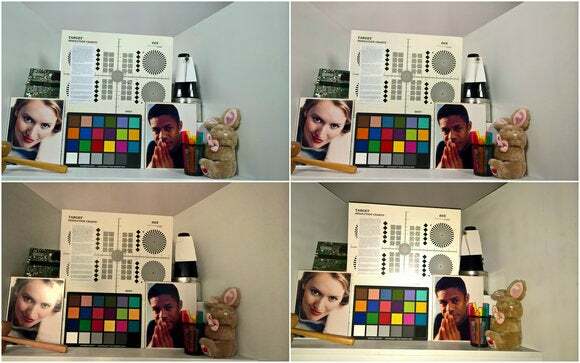 Note the low-light test photos we shot, which blew everything out. Another photo I shot indoors with the flash on gave me the same result. Outside and at night, the Liquid Jade Primo’s dual-LED flash seems underpowered except at short distances. Like the Lumia 950, Acer’s phone also uses Microsoft’s post-processing HDR technology to adjust lighting when that feature is enabled. 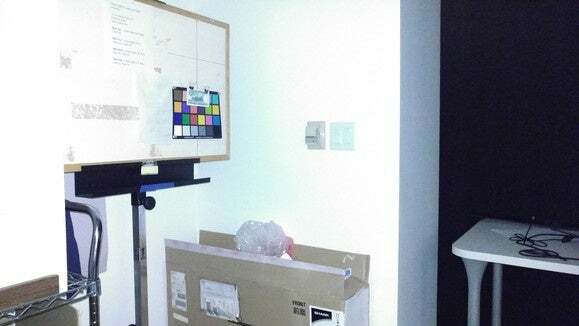 ...as it did to this random corner of the room we use for photo testing. But the flash on the Liquid Jade Primo doesn’t do much to light this night scene. Video shot with the Liquid Jade Primo looked pretty grainy, though a few selfies I took with it (video and still images) looked decent. Keep in mind that, when used with Skype, the front-facing camera becomes your window to the world. However, Acer’s omission of the Anniversary Update means that Skype communications will be handled by two separate apps: chats and audio calls inside the main Skype app, and video calls inside the Skype Video app. It’s annoying and arbitrary, but that’s the way it is for now. The Liquid Jade Primo suffers somewhat on outdoor shots. Some bugs and camera glitches mar an otherwise competent Windows phone that aspires to replace your PC. Who would expect a keyboard and mouse to ship with a phone?